Most Swedes favor a strong military. But not everyone is convinced that there is strength in numbers. During the Cold War, when Sweden was neutral, its frequent war games in its northern Norrbotten region were aimed at training to stall a Soviet invasion until help could arrive. Today, Sweden is closely affiliated with NATO (though not a member). 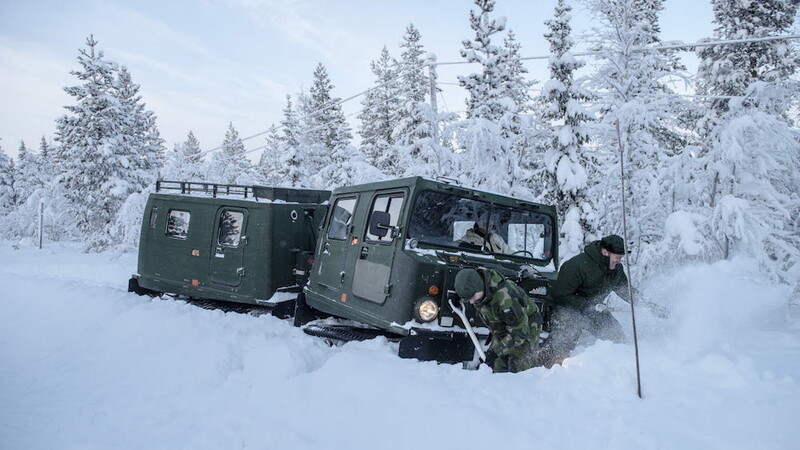 Its exercises, such as this week’s Northern Wind exercise, are still aimed at defending the country from attack, though now just who the foe might be is left unstated. Other things have also changed in recent years. Take Sweden’s military budget. After falling from 4 percent of GDP in 1963 to 1 percent in 2015, a near-unanimous Riksdag (the national assembly) has approved an increase in defense spending that will see spending rise 40 percent between 2016 and 2020. The extra funding will go to things like standing up new units in Sweden’s eastern regions and to increase the number of conscripts. There are several reasons why, but all lead back to Russia. First, in 2014, Russia annexed Crimea and abetted a separatist movement in eastern Ukraine around the same time. This came several years after it took control of about 20 percent of neighboring Georgia’s territory following a short military conflict. Had Moscow kept such activities confined to southeastern Europe, Stockholm would likely have sent diplomatic protests, but, without a threat close to home, lawmakers’ focus would have been on budget-cutting. Instead, a series of confirmed violations of Sweden’s territorial waters and airspace suggested Moscow might be up to something similar on its northwestern flank. Today, few oppose rebuilding the country’s military. Indeed, even for those on the political left, opposing a strong military is more controversial than supporting one. What is more of a problem for them is their country’s partnership with NATO, which they see as an unnecessary provocation of Russia. “Training with NATO troops contributes to military tension and it draws Sweden into NATO’s military build-up against Russia,” says a political activist from Vänstrepartiet handing out anti-NATO leaflets this weekend in Luleå, Sweden, the largest city in Norrbotten. If opponents of cooperating with NATO look carefully, they will see that the defense ministry has been careful not to associate it with the alliance. Norway, the U.K. and the U.S. (all NATO members) and Finland (which like Sweden, isn’t a NATO member, but has trained with the alliance) are contributing more than half of the 10,000 troops taking part in Northern Wind, yet the brief circulated to the public doesn’t mention NATO at all. Still, it describes one of the main goals of the exercise as improving the ability of the participating countries (and, one would assume, their allies) to fight together. Opponents recognise there is a difference between training with a NATO member and training with NATO, but they fret that the military’s goal of “interoperability” with other countries is just another word for alliance. Those who support closer cooperation with NATO argue, on the other hand, that collaboration of this sort is needed if Russia is to be deterred. In the event it is not, Sweden will need to turn to someone for help, they point out, and who else would that be than NATO? As countries with a common rival, they are, by default, allies. Making the most of this relationship requires training together. Those who back more exercises with NATO say that practice makes perfect. That philosophy, borrowed from the athletic world, today comes with a caveat from trainers. Much like the NATO skeptics, they warn that what practice really does is make things permanent. When Canada in 2016, placed a moratorium on new oil and gas activities in all offshore Canadian Arctic waters, it was on the condition the decision would apply, initially, for five years. Any extension would only be granted after a thorough review. This week, that process will take a step forward when the Nunavut Impact Review Board holds its final public meeting in connection with an assessment of the impact of drilling in Baffin Bay and the Davis Strait. Once the review is complete, the NIRB will provide a report and recommendations to officials in Ottawa to inform its decision-making before the 2021 deadline. Unlike a normal review, the current assessment is not being conducted in connection with a proposed development project. Instead, it will focus possible and hypothetical scenarios that outline possible activities and components of the oil and gas lifecycle that could realistically be expected to occur if oil and gas development was approved in the area.